Home Politics Nigeria Politics Who is burning INEC offices? Why? ABUJA- On April 8, 2011, the office of the Independent National Electoral Commission INEC in Suleja, Niger state was bombed. Since then, it has almost become a common occurrence to attack the commission in the prelude or aftermath of any crucial election, but Nigeria has never had it this bad, with the razing of three INEC offices within 12 days. 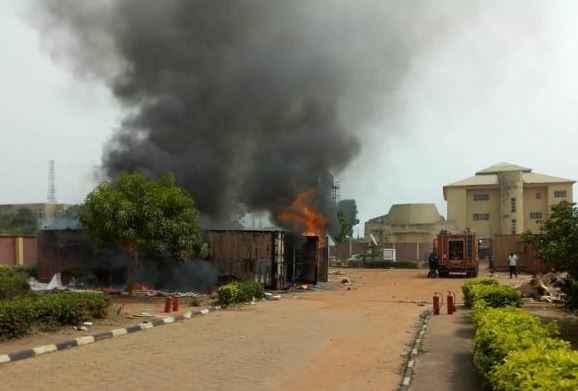 Last Tuesday, the INEC office in Anambra State was razed, the third of such incidents in less than two weeks, following closely behind those of lsiala Ngwa and Qua’an Pan Local Government offices of Abia and Plateau States respectively. In the Anambra incident, initial assessment confirmed that a total of 4, 695 of Smart Card Readers were destroyed in the inferno. In previous incidents some of the items destroyed in Isiala Ngwa South Local Government included 2979 Permanent Voters’ Cards (PVCs) and other materials. At the Qua’an Pan office, items destroyed included 5987 uncollected Permanent Voters’ Cards (PVCs), 380 Voting Cubicles, 755 ballot boxes, 14 generators, election forms and official stamps. There are indications that some partisans might be working with fifth columnists to get the elections postponed. The two major parties, the All Progressives Congress, APC and the Peoples Democratic Party PDP have continued to also trade accusations and counter accusations in this regard. During the last governorship election in Edo State, the ruling All Progressives Congress APC and the governor of the of the state at the time, Comrade Adams Oshiomhole were vehemently opposed to the conduct of the election as earlier scheduled. They tried unsuccessfully to get it postponed. Investigations revealed that the INEC Chairman, Prof. Mahmood Yakubu was adamant in his resolve to stick to the timetable, not until high-profile state actors weighed in, and relying on a phony security report, arm-twisted the commission into shifting the elections. The current attacks on INEC offices could be a new method of certain partisan persons to get the commission to shift the elections or to prepare grounds for the evolution of a security report that could force INEC to alter the election schedule which was prepared a long time ago. It could also be a ploy to disenfranchise voters by ensuring the suspension of elections in the affected areas. But Oshiomhole says the PDP is afraid of going into the elections. “Out of the three states where INEC offices were attacked, two are non-PDP states. They know that they cannot win elections in those States, hence they resort to attacking INEC offices”, Oshiomhole said Wednesday evening. In all of these, the INEC has insisted that it would not postpone the elections according to Prof. Mahmood Yakubu, chairman of the election management body. “The Commission wishes to assure all Nigerians that it will not succumb to the antics of arsonists whose motive might be to create fear in the minds of voters and sabotage the conduct of the 2019 general elections”, said Festus Okoye, a national commissioner at INEC. As for Anambra, INEC has said despite the temporary setback, it would not postpone the elections but rather mop up spare card readers from other states for the exercise. As a stakeholder said yesterday, “For whatever it is worth, the federal government must halt the attacks on INEC. The Muhammadu Buhari administration must hold the Ministry of Interior responsible for further attacks on any INEC office. The Police is under the ministry, likewise the Federal Fire Service. This is the time for the Interior minister, Gen. Abdulrahman Dambazau to show leadership and get the police as well as the fire service to discharge their mandate effectively. That the Interior ministry has not spoken on the renewed attacks on INEC is suspect. As at press time yesterday party sources could not confirm speculations that the national mega rally would hold. The rally had been expected to hold yesterday but could not on account of the clash with the rally of the APC which also held in Abuja.